To this point, research hasn’t been able to give us a consensus answer to the aforementioned questions….until now (perhaps). In Sports Health: A Multidisciplinary Approach, a 2018 pilot study was conducted with the sole aim of answering the following question...what qualities are high-speed serves built from? In this post, we’ll review the pilot study - looking at what the researchers did, their results, the and subsequent implications for players & coaches. Finally, we’ll finish off with a short critique - what was done well and what gaps should future studies aim to fill in this domain. According to previous work on energy flow during the serve (Martin et al 2014), the upper-extremity (UE) and and lower-extremity (LE) use about equally the same amount of kinetic energy. In terms of skill, previous studies found, through LE electromyogram testing, that skilled players have more refined neuromuscular coordination patterns during the service motion when compared to less skilled players. 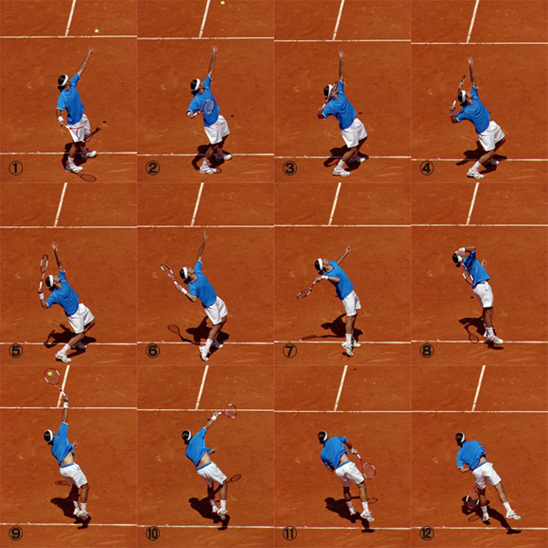 Furthermore, it’s the ‘dynamic LE drive’ during the middle-cocking and acceleration stages (sequence 7 through 9 in the images below) of the serve that are key to better UE/thoracic rotations & ultimately, force generation. Also, greater force generation in the LE has been linked with increased serve speed. The authors of this pilot study, however, state that research has mixed results when it comes to UE & LE strength values and serve speed. On the other hand, variables that researchers have found a consistently positive correlation with serve speed include the following: player height, player skill, increased wrist flexion, shoulder flexion and internal rotations ranges of motion (ROM). It’s thus not surprising that serve speed is likely a combination of several factors. ROM assessments for shoulder external & internal rotation, trunk rotation, hip external & internal rotation and ankle dorsiflexion. Isometric strength testing focused on the rotator cuff, scapula and hip musculature. Motor control, evaluated through upper and lower extremity Y-balance testing. Power assessments, conducted using previously accepted testing measures, included the horizontal broad jump, single-leg hop (ipsilateral and contralateral) along with seated unilateral med ball (MB) shot put throws (assessing both dominant and non-dominant sides). Based on player profiles, skill level along with height were variables considered in the analysis of serve speed. Click here for the full PDF study. ROM - Out of 13 ROM locations that were assessed, only contralateral hip external rotation (ER) - if you’re a right hander, that would be ER of the left hip - had a significant and positive correlation to serve speed. Strength - Out of 14 tests, none of the isometric strength positions demonstrated a significant correlation to serve speed. Motor Control Testing - Out of a total of 12 Y-balance tests (6 upper and 6 lower), only 1 UE Y-balance test revealed a positive and significant correlation to serve speed. This was the anterolateral position. Power Testing	- The following power tests; contralateral single-leg (SL) hop test, ipsilateral SL hop test, dominant arm seated shot put throw and non-dominant arm seated shot put throw, were all positively and significantly correlated to serve speed. Broad jump was the only power test that did not reveal a significant correlation to serve speed. The tables below showcases the descriptive results of each assessment. The findings of this study support the notion that player skill AND player height are significant contributors to serve speed performance - more so than any other factor - both contributing ~30% each to serve speed performance (for a total of 60%). Lastly, most of the ROM tests along with the isometric strength tests revealed NO influence on serve speed. Because the service motion relies on the storage and release of elastic energy, individual, isolated performance aspects cannot account for the dynamic nature of the stroke. When it comes to determining the key factors that influence serve speed production, this pilot study is a step in the right direction. We will briefly look at how this study helps coaches and players while providing feedback on what might be worth exploring in future studies. Firstly, while I do believe the LE plays a critical role during the drive (middle-cocking to acceleration phases), it’s overemphasis can be detrimental. As noted above, the UE contributes just as much to the serve as does the LE...it’s both strength/power AND coordination of the LE, timing it with the UE thoracic rotation and subsequent propelling of the serving arm, that makes for an efficient, repeatable and powerful serve. That said, there was a fundamental mistake with this study’s use of strength testing. While the power oriented exercises were multi-joint movements that rely on multiple muscle groups/body parts and that are executed in a dynamic manner, the strength exercises chosen were isolatory. We know that serving requires a fairly large force demand from the LE - when choosing isometric strength tests, we are neglecting the principle of specificity. Strength exercises that reflect the specific force/velocity demands of the serve - a squatting pattern for the LE, a pressing movement (incline bench press - bilateral and/or unilateral) for the UE - would have better reflected the inherent nature of the serve. While shoulder internal rotation ROM wasn’t a predictor of serve performance in this study, previous reports have shown positive correlations between maximum isometric strength and ball velocity. More investigations are warranted as this study showed no correlation with either strength or flexibility of the IR of the shoulder. In terms of power testing, the broad jump was the only power exercise that wasn’t correlated to serve speed. The authors suggest that this is due to the fact that horizontal jumping distance is not correlated to serving - perhaps due to specificity once again (the serve has a greater vertical power component compared to horizontal). But why were the single-leg hops (also horizontal jumping tests) correlated? Looking at the methods section, the broad jump test was performed prior to the single-leg hop tests - was there perhaps a potentiating effect from this power exercise that helped augment the performance of the other tests? Another explanation - perhaps there is a greater emphasis on unilateral power during the service motion, compared to bilateral power - something future studies should aim to investigate. Interestingly, both dominant and non-dominant seated shot-put throws (image above), were correlated to serve speed. It’s likely that UE power, in general, is reflective of explosive actions. A physical prep program that develops UE power in a more general sense is warranted for players - with specific means being added on in later training phases. The motor control tests that did not show significance were likely not specific enough to the positions and dynamic requirements of the service motion. The anterolateral position reflects a demanding position - one that somewhat replicates the position of the body at impact. This test challenges not only core stability but flexibility in the torso/upper extremity of the dominant arm, along with scapular health of both dominant and non-dominant sides (See image above). As for the hip, if the contralateral hip has poor external ROM, the trunk & upper extremity aren’t free to move through contact as easily - players begin to force the issue, compensating with the arm to attain the same type of speed - this is a concern from an injury perspective along with a performance perspective (shoulder muscles fatigue faster compared to LE/trunk). Coaches should be very cautious and emphasize regular flexibility training of this region (pic below). Based on these findings, it’s quite important to improve serve skill (via improved mechanics) as this still has the greatest impact on serve speed. Height is a close second and cannot be influenced via training, however, perhaps ball impact height could. Increasing ball impact, could in theory, be accomplished by increasing vertical jump height - an extra 2-3 inches on ball impact height, might have a small impact on ball speed (but this would have to be substantiated in a future study). The beauty is, if you increase vertical jump, you’re effectively increasing LE power - this in itself may help increase serve speed. A note to coaches with pre-pubescent juniors, be careful not to chase the golden goose - in other words, rushing to increase serve speed (and it’s power sub-factors), is ill-advised. This may be very strenuous on the body of a young child - especially on the shoulder as the various connective tissues are still under-developed. This may seem obvious but I’ve seen far too many coaches trying to push the envelope here. Instead, improve serve mechanics, serve tactics, proper landing and deceleration skills etc. The nature of maturation is such that strength & power will develop irrespective of training (that’s not to say you cannot train juniors to improve physical abilities...but do so progressively). Trunk strength is also key, both in isometric positions and via dynamic/maximum lifts - i.e. power snatches, back squats etc. Overall strength exercises that have a large demand - both uni and bi-lateral - are key to force generation and ultimately, expression. Studies should look at these exercises in the future to find correlations. While this study has put the tennis serve on the right track in terms of predicting it’s most important factors for speed production - there was still a 16% gap where none of the variables measured could predict serve speed (84% was predicted via the correlated tests). Future studies should compare the objective tests from this study with other performance variables that may be more specific in nature. This would, in theory, help close the gap on which measures have a greater impact on serve speed.